Even before you bring your pet to the clinic, we’re offering a way to start the calming process before you leave your home! At your convenience, you can drop by the office and pick up an Adaptil infused bandana for your dog or a Feliway wipe or towel for your cat. Both of these “miracle-in-a-bottle” pheromones are designed to mimic the smells associated with home and the safety your home provides. They literally fool your pet into thinking they are in a familiar place because the smell of the pheromone mimics the “safe” smell of your pet’s natural environment. The effect is amazing! We can also apply bandanas which have already had pheromones previously applied to your pet when you arrive in the clinic. For our feline friends, we ask that when you arrive you allow us to put you and your cat directly into an exam room to wait. This separates your calm cat from the noisy dogs in the lobby, further decreasing their stress response. We will also cover your pet carrier in a towel in which Feliway has been applied, further decreasing the stress of your feline companion. When you first enter the exam room, you will notice soft, classical music playing. This album is called “Through a Dog’s/Cat's Ear.” and has been clinically proven to decrease stress in dogs and cats. At the beginning of your appointment you will also be asked if our staff can give your pet some very tasty treats. Food is a major motivator for both cats and dogs and our tasty treats can hardly be resisted! 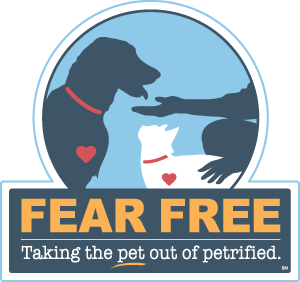 We ask that you bring your pet on an empty stomach as our treats will be more readily received and the act of taking food from a stranger decreases the fear response your pet may have and fosters a feeling of trust between your pet and our staff. Behold! Food! Encouraging friendships between your pet and our caring doctors and assistants! We will try to ensure your pet receives a steady supply of treats throughout the exam and vaccination process, many times while your pet is distracted with food, they won’t even notice the vaccination itself or the blood draw for the blood test.